ACT for Bees members had a beautiful warm autumn day to participate in the Beekeepers ACT Field Day last Saturday 17 March. The Field Day included talks and demonstrations of beekeeping (both native and honeybees) as well as honey sales, gear vendors and our attractive ACT for Bees stall. We had a colourful display board with a wealth of information and images about bees and how they help us and how we can help them be healthy. We talked with visitors and gave out information about bee friendly gardening, how important bees are for food production and how they have been in decline. We had pleasure in telling them that some businesses like Bunnings are phasing out the sale of Neonicotinoids pesticide. The bees are very happy and so are we! The highlight attraction was our Apple Trees. They were in full blossom and needed pollinating so they could grow some apples and seeds. We needed pollinators!! Where were the working bees. Then they started coming – a few forager bees (the children) flew in from far and wide. With their bee wings and antennae in tact they buzzed around and found the blossoms. They flew off and told their friends and more working bees buzzed in to lend a helping hand – I mean legs. Collecting pollen and spreading the pollen, first on one tree and then on the other and back again. Everyone was happy. The bees got the pollen they needed to feed their hive and the apple tree blossoms got the cross pollination they needed to grow lots of healthy apples. The children, our worker bees, received a yummy organic apple to celebrate the harvest and their hard work. They learnt about where apples come from and how the bees help us grow them. 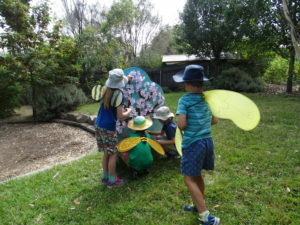 Everyone had a lot of fun If you missed out, come along to the event today in Hackett at 3pm where there will be a Bee Friendly Gardens talk as well as an exciting range of childrens activities with a bee focus. Last chance this season to be a bee and pollinate the apple trees!